Has been heavily Photoshoped so edges aren't great. decent view of edge of sleeve cap. Standing on the side, very wide dark trailer shot - each further away. Could these sleeves be split? long shot, can see a bit of the back. be careful of using this shot for any detail. It has been heavily reworked. Lacing is in the center back not side. 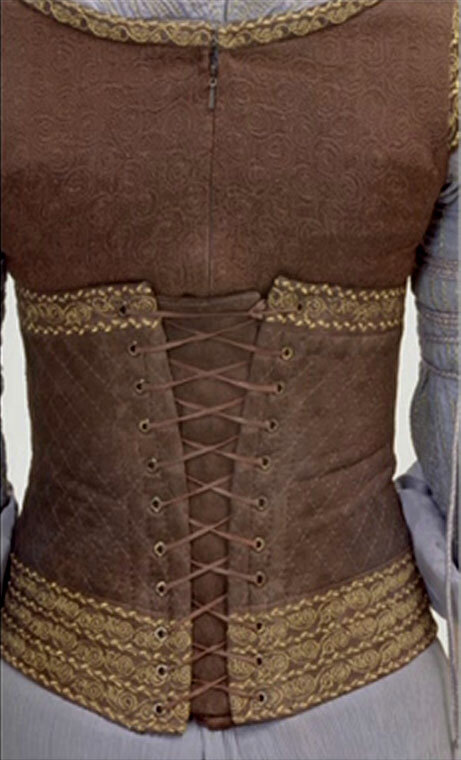 Brown corset/vest with trim around the neckline and shoulders – gold? "I am always asked which costumes are my favorites and my answer has always been none, but here is one of the exceptions. 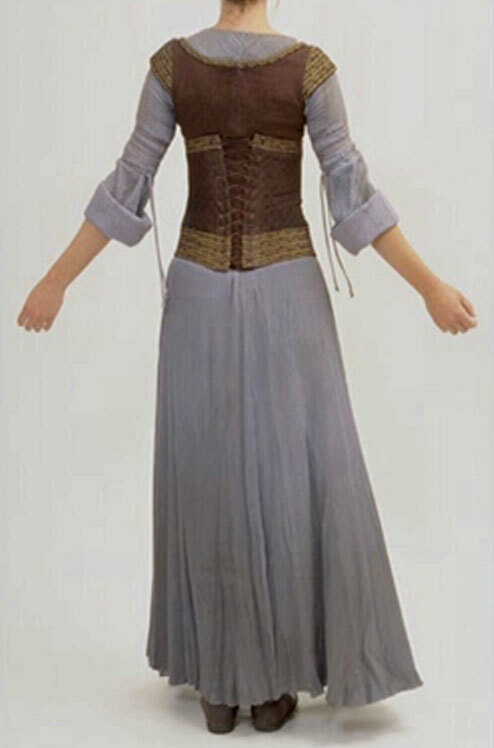 This dress epitomized for me the crossover between woman and warrior, the enduring conflict in Eowyn's character. The fabric of the dress is the softest silk, with very detailed pin-tucking and embroidery at the neck. 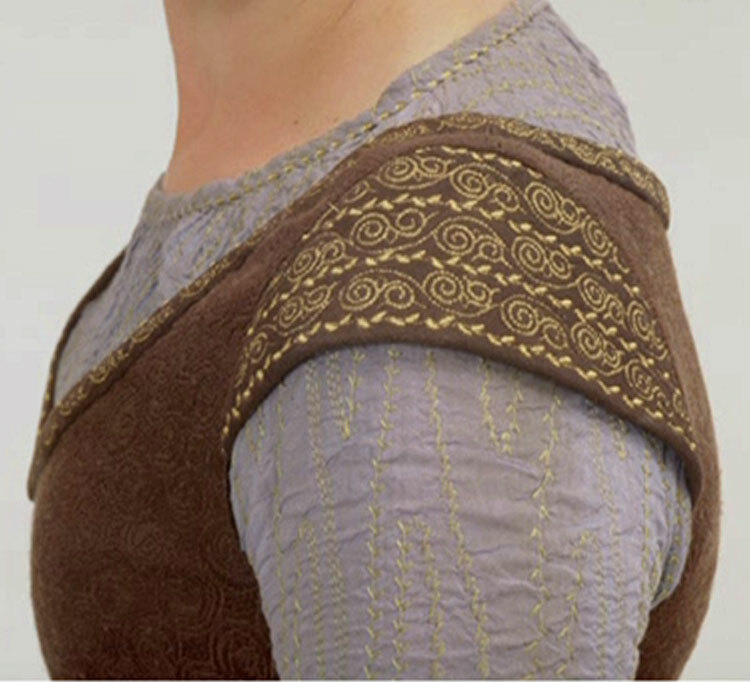 We hand-wove the lacing that holds the sleeve back - an important element for fighting as we didn't want Eowyn to be inhibited by the volume of fabric in the sleeve. The rich brown suede of the corset is quilted, then embroidered in a delicate gold thread. It took a lot of experimentation to get the balance of the embroidery right - adding decoration while still keeping a practical value to the garment as a whole." Full length gown, cream damask- cream on cream woven pattern of swirls. Odd shaped neck, not a V or a keyhole. The fabric is gathered into the neck line slightly. There looks to be a half inch facing or trim around the top edge. Sleeves appear to be bloused up and held in place with ties. Bottom of the sleeves are open and go most of the way to the ground. They end mid calf. A guess is that these sleeves are a lot more complicated than they look, but will need to check whether movie comes out. The lower sleeve is pulled up a bit and it's narrower tie is attached to the arm ties. A close look at the cream braided ties... and they appear to be secured to a band of the same fabric, not actually wrapped around the sleeves. From a film point of view, it makes sense for continuity. Then that begs the question if the top "puffs" are mounded on another sleeve to keep them pulled though all her movements. Note, in some version, they are just tied. the band is not there. However, something still seams to be holding them in place. Fabric looks like it could be a fine linen or silk. Odds are it's more likely to be a linen jacquard. The weight is reminiscent of a fine table cloth. Note: jacquard is just defines a weave (like tapestry, but all one color). Note the same hair and sleeves are a piece of the composite on the "white toy dress". What is the nature of this corset/vest? 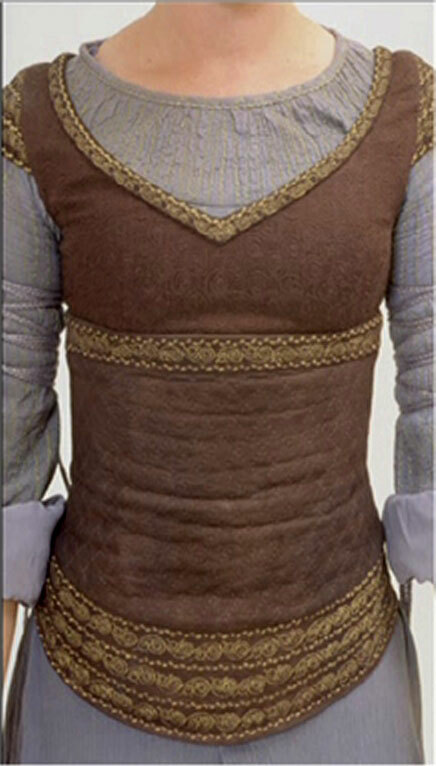 Is it dark overgarment, or is it the corset of maille that Eowyn wears as a mark of rank to lead her people in hiding? Are there two layers to the white dress (white & off-white/cream)? Sleeve comments, there are probably multiple version of the silk... to hold the sleeves prettily in place. I used about 11 yards? I think my first order was for 8 yards, my second was for three. There's 6 yards in the skirt, about a yard and a half in each sleeve and about half a yard in the bodice. 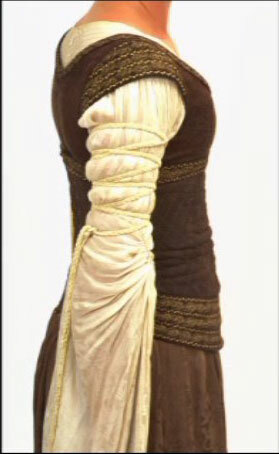 Simple skirt that is probably layered on top of the shield maiden outfit. Waist band and straight gathered. just like a hobbit shirt. Looks at this, however, this skirt is made out of silk and tightly gathered at a 2.5:1 or 3:1 ratio. (3 inches of fabric for ever one inch of waist). Slightly lighter brown than the vest. May have a woven pattern in it. The skirt is hemmed a tad high so that we can just seen the tip of her brown boots. 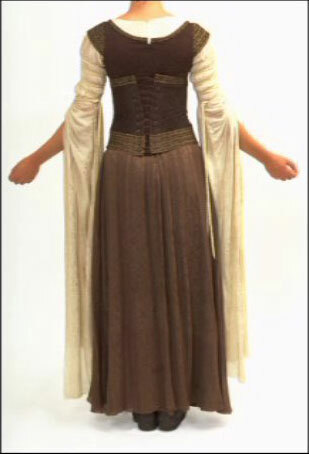 Can see Eowyn from the back. Skirt is rather full.